* Our Club House Theater features a center panel that is 24" wide by 47" tall and wing panels that are each 21" wide helping create a private play space. * Metal braces lock the theater open during use. 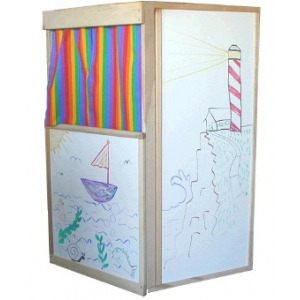 * The theater opening is 22" wide by 16-3/4" tall with a pair of colorful curtains (curtain color and pattern may vary from those shown). * Choice of art surfaces - either green chalkboard or white markerboard.